Johnny T is a wimp. I can ride a bull with the best of 'em. Here's the trick, and this is the part that they don't tell you about... Tight Pants. My thighs are still sore and bruised in places where it is probably best that they are not sore and bruised. 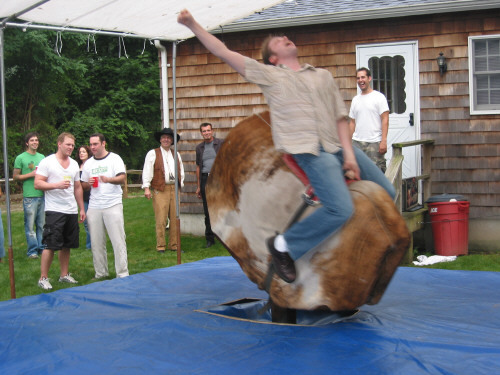 It's actually much harder to ride a mechanical bull than it looks. Observers may think that the thing is barely moving while the rider finds themselves being thrashed around as never before. Mechanical bulls are evil.